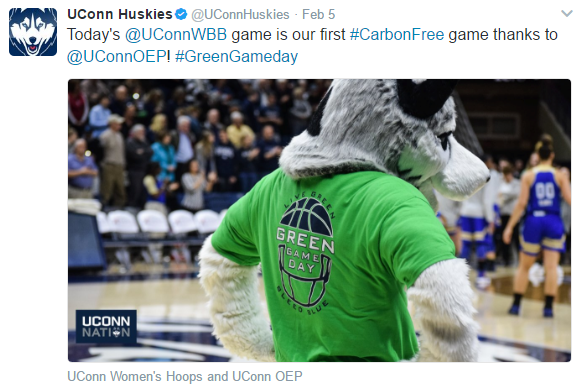 First Ever Carbon-Free UConn Basketball Games! Every spring, volunteers from the EcoHusky student group and EcoHouse learning community come together to raise environmental awareness at Basketball Green Game Days. By teaching fans how to recycle, and collecting bottles at the end of the game, volunteers always play an integral role in making these events “green.” This year’s Green Game Days were special because, for the very first time, the Office of Environmental Policy purchased carbon offsets to make the games carbon-free! Carbon offsets are credits purchased that represent the reduction of an amount of carbon dioxide emissions. In cases such as powering a basketball game, where it is difficult or impossible to reduce associated emissions, a carbon offset can be purchased to fund the reduction of greenhouse gases elsewhere. This is a great tool for organizations that would like to mitigate their carbon impacts, but when it is not feasible for them to do so directly. We would like to thank all of our volunteers for their time and enthusiasm. With their help, we were able to collect enough bottles to donate $40 to the Campus Sustainability Fund to support more programs and initiatives to raise environmental awareness. 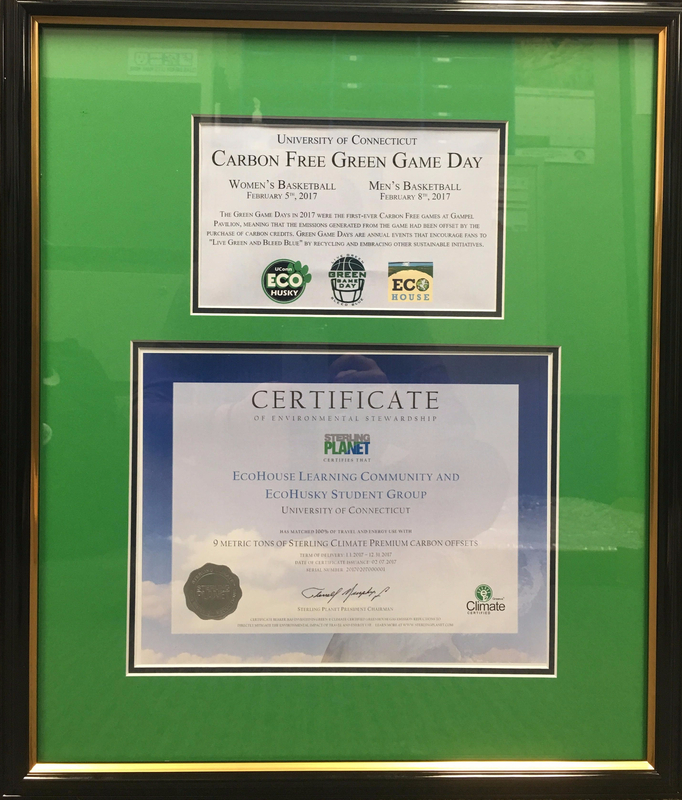 We would also like to thank UConn Athletics for their time and effort to promote sustainability. We greatly appreciate the P.A. announcements, video board slides, and social media posts throughout the events. We look forward to working with you at future Green Game Days! As part of UConn’s 2020 Vision for Campus Sustainability and Climate Leadership, the university is devoted to creating more naturally-landscaped open spaces through the expansion of the Hillside Environmental Education Park (HEEP), the implementation of the Sustainable Sites Initiative (SITES), and increasing passive and active open spaces. The HEEP is the result of the Landfill Project, an environmental remediation project the university undertook from the 1990s to the 2000s, and included the construction of C-Lot, which caps the old landfill. The park is a preservation of about 33 acres of wetlands and 31 acres of uplands, and an additional 101 acres have been added following the construction of the new entrance, Discovery Drive, resulting in 165 acres of vernal pools, wetlands, riparian zones, and uplands. The construction of the new road involved extensive planning to preserve the surrounding area, including implementing wildlife tunnels under the road large enough for deer, Cape Cod curbs that make it easier for amphibians to climb out of the road, curved barriers to deter migrating wildlife from going across the road, and is a reduced-salt zone. The 101 acres surrounding the area provide a natural barrier to protect both the wetland and woodland networks. Recreational trails, management of invasive species and educational signage throughout the area have been implemented and will be improved upon within the next few years. Additionally, UConn is committed to using the Sustainable Sites Initiative, either independently or in conjunction with LEED, on capital projects to develop landscapes in as beneficial and measurable ways as buildings. This program is based on the premise that land is a critical part of the built environment and can be “planned, designed, developed, and maintained to protect and enhance the benefits derived from healthy, functioning landscapes” (SITES). The preservation of natural systems and resources while creating open spaces is another way UConn is achieving its 2020 vision. 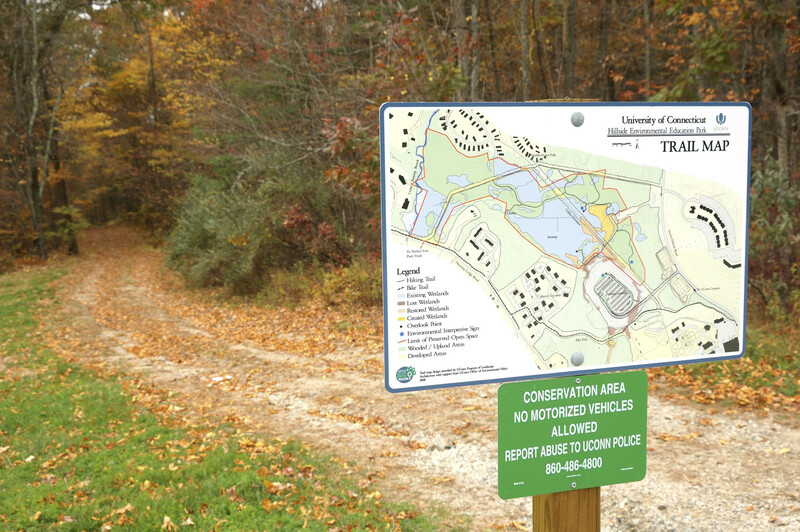 The UConn Campus Master plan includes the creation of woodland corridors for both north and south campuses to connect wildlife populations separated by human activities. These pedestrian-oriented spaces will provide a natural landscape, facilitating stormwater runoff re-absorption. Additionally, 35-acres of farm land will be added to Spring Manor farm as a result of the agricultural land that was lost during the construction of Charter Oak Apartments and Discovery Drive. Wooded acres will transition back to agricultural production and will provide more land for crop rotation, an important factor for soil conservation management practices. Returning the land to agricultural production is also an important step in maintaining the University’s land-grant heritage.